Making Everyone’s Favorite Chinese Dish At Home Is Easier Than I Thought! 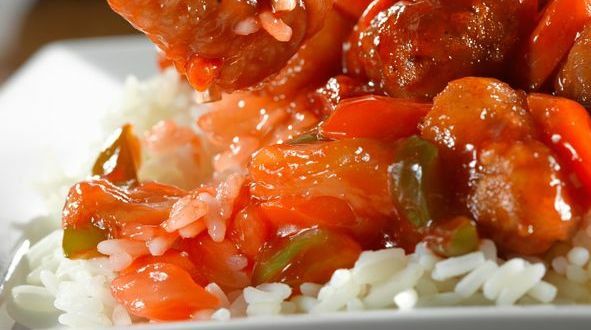 A favorite Chinese recipe for many is sweet and sour pork. It’s arguably one of the most well known Chinese dishes in the world. Sweet and sour pork, traditionally called “goo lou yok” is originally a Cantonese dish that gets its name from its combination of ingredients: sweetness from the sugar and sourness from the tangy ketchup and rice vinegar. The pork is stir fried in the sauce along with some red bell peppers and pineapple pieces. Cut the pork shoulder into bite sized pieces and marinate with 1 teaspoon soy sauce, 1/2 teaspoon corn flour, and 1/2 teaspoon rice wine for 15-20 minutes. Mix together all of the ingredients for the sauce until well combined and set aside. Sift together the dry ingredients of the frying batter, then add in the egg, water, and canola oil to form a thick batter. After the pork is done marinating, transfer the pork pieces into the batter and make sure they are well coated. Add enough canola oil to a skillet for deep-frying. Once the oil is hot (360F to 375F), deep fry the pork pieces until they turn golden grown. scoop out with a slotted spoon and drain on paper towels. Heat up a wok and add 2 teaspoons canola oil. Add the onion and pineapple pieces. Fry about 2 minutes, stirring and flipping until the pineapple starts to brown. Add the ginger and pepper and cook, stirring constantly until the peppers are crisp and tender. Pour in the sauce. Cook, stirring quickly. As soon as the sauce thickens, add the pork and stir to combine and coat. Transfer to a serving plate and garnish with the green onion. Serve with white rice.